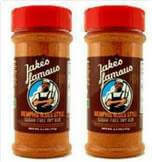 IN STOCK: Jake's Medium BBQ Sauce for sale Special for chicken, ribs, pork, fish, steaks and Tri-Tip. Flavor and heat profile is excellent with smooth waves of heat. Natural ingredients make the natural bbq sauce healthier. Made without high fructose corn syrup which eliminates that bloated feeling afterward. No MSG for those who are sensitive or allergic. No preservative flavor enhancers just plain natural ingredients. The long and short of this product is that it's for those who want an old-school barbecue sauce with the perfect level of medium heat. The barbecue sauce is made medium hot with select key ingredients different from our Really Good Mild BBQ Sauce for sale, this sauce focuses on molasses, tomatoes, apple cider vinegar, brown sugar, liquid smoke for taste, aroma and color, onion, garlic, salt and spices with a select blend of ginger, habanero and jalapeno chili capsicum blend for more consistent flavor. Just like the Really Good Mild we've made the Really Nice Medium Barbecue sauce for sale thicker than water but a little less thick than tomato ketchup. The sauce has just the right amount of spiciness and vinegar for marinating combined with smokiness. If you don't have a wood smoker then you can achieve similar results simply by just basting on the product after marinating for 45 minutes to an hour. Grilling is easy just place on a grill with medium to medium-high heat at about 225 degrees for slow barbecuing or 275 degrees for quicker barbecue. Of course higher heat requires more consistent watching of the flame to ensure the meat doesn't burn. This sauce produces a wonderfully warm heat and an old-school taste with flavors reminiscent of Georgia, Mississippi, Florida and with a slight cross of Texas barbecues. The sauce is perfect for basting and marinates deeply within 45 minutes to an hour. The sauce is made from natural, gluten-free ingredients. The sauce has just a slight sweetness to raise the taste buds. And the sauce can be used overnight in the marinating process along with delivering smokiness for those who do not have wood smokers readily available. Finally, the sauce reduces the amount of time you spend on the grill. It does not require hours of blending as some do once they buy a sauce. With that additional time saving besides being one less thing to worry about it means you can spend more time enjoying the barbecue and less time preparing it. The perfect pairings for the sauce are baby back ribs, spare ribs, hamburgers, chuck roast, lamb shanks, marinated and roasted chicken and hot dogs. We suggest reserving a heated side dish of the sauce for dipping at parties and picnics complimented with a blue cheese dip. Speaking of baby back ribs we've got the perfect sauce and the perfect process for making those flavorful spicy ribs. If you don't have a grill no problem. This Really Medium natural Barbecue Sauce for sale is absolute perfection on ribs in the oven. The recipe uses straightforward and uses very few ingredients and the ribs will come out nice and moist with just the right amount of spiciness. The steps are simple and included here. Just select your baby back bbq ribs or spare ribs along with Jake's Famous Medium BBQ Sauce for sale and Jake's Tri-Tip, Steak and Rib Rub or other Jake's Famous Dry Rub. To achieve maximum flavor it's a good idea to properly address your ribs. Meaning the best have the silver membrane removed from the curved side of the rib bones. The best way to do this is after the ribs have been properly cleaned and patted dry take a paper towel and grasp an edge of the silver membrane starting at the top of the ribs. By grasping an edge and pulling toward the other end of the meat you'll start to see the membrane separate. The first few times you pull on the membrane it might appear slippery and may fold back, no matter keep pulling with increased force and the membrane will come off easily. Some say that it's best to remove the membrane while it's cold I like doing it just after cleaning as the membrane is more pliable. Once the membrane is removed generously with the rub and wrap with foil. At this point, I would consider using a true barbecue secret which is to increase the tenderizing of the meat by adding mustard. The mustard must rest on the meat for at least an hour to be effective. Once on the mustard will enhance the meat with a nice tangy background flavor. Then let them rest in the foil for about an hour. Set your oven to 350 degrees. While the oven is reaching temperature set the meat on the counter so that they come to room temperature. Place the meat in foil in a metal baking pan. Cook for about two hours and remove. Open just the top of the foil and lather on Jake's Famous Really Good Mild Best BBQ Sauce covering both sides. After the sauce is applied leave the meat side up with the foil open. Turn the oven to 400 degrees and cook for approximately 15 to 20 minutes at 400 degrees. The additional heat will create a caramelizing effect on the top. Once done remove and cover allowing the ribs to rest for about 20 to 30 minutes. Keep some extra Jake's Famous Medium Barbecue Sauce on the side in a warm dish then serve and enjoy. Additional pairings of coleslaw, corn on the cob and baked potatoes will really make this meal stand up. Scott Roberts wrote:"Overall: Buy this stuff. It's the real deal, and it may become one of the 2 or 3 best barbecue sauces you've ever eaten as it has with me. Yet another spicy food product that gets the "Scotty Highest Recommendation." Recommended Uses: BBQ Hot Wings, homemade barbecue bbq rib recipes, bbq chicken recipes, bbq beef recipes, wings recipes, Barbecue Sauce and glaze for fish and more. Details: Convenient, easy to use 12 Oz recyclable glass containers, stores easily with a shelf live of 18 Months. Need great gifts Buy Jake’s Famous Really Nice Medium Hot natural Barbecue Sauce. At Jake's Famous we guarantee you an exceptional barbecue experience. We promise to treat you like friends and family and to serve you our products that have been prepared with focus, uncompromising quality, and our thorough standards. If you are not completely satisfied, just let us know, and we will honor our guarantee.